I am lucky to be in control of who I hire and fire. My district doesn't care and my principal doesn't care. If this is also your situation, you too should consider yourself lucky. If it's not, I feel for you. It's difficult to share your space with another person, especially if you have no say in who that person is. My advice would be to try to have some input. Speak to your principal and ask if you can be included in interviews. Then come prepared- have specific questions. You are the one who will work directly with this person everyday and you know what their responsibilities are. You can shed a lot of light on areas that your principal may not have considered. Especially all of you self-contained teachers. I hate to say it, but it's likely that your administration doesn't really have much of a clue of what you do on a daily basis. If you are in control of who you hire, be sure to conduct a thorough interview. If you are interviewing during the school day, stop by your classroom and let them get a glimpse of what goes on. I have interviewed people who really had no clue what to expect and being able to see your classroom, even for just a minute, gives them a better idea of what the job will consist of. Also, be realistic. I make sure that I give plenty of information when I interview. If there will be intense problem behavior, tell them. It's best not to end up hiring someone who doesn't have a clue of the reality of our jobs. Here are a few of my go-to interview questions. 1. 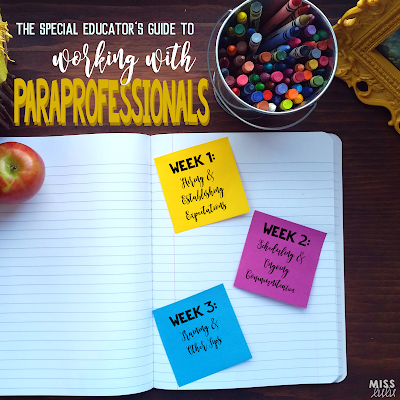 What do you see as your role as a paraprofessional? This answer may give you a lot of insight as to whether they are on the same page as you. 2. What do you believe is the purpose of special education? This may seem like one of those dig deep questions, but it gives me the best idea of how this person will treat the students. It's great that we all have different beliefs, but I need to know that you will work hard to push independence and have high expectations for the students. I give specific scenarios- one with intense aggressive behavior, one about an emotional meltdown, and one about being in another teacher's classroom helping a student. I always start the school year off with a Back to School staff meeting. I do this before school starts. My paras are able to be paid for this, but if that's not a possibility, offer to buy them lunch for their attendance. It will be worth it to be able to sit down and lay out your expectations BEFORE school starts. I provide my paras with a handbook that I update each year. In it, I include my attendance policy, classroom expectations, dress code, confidentiality information, staff meeting schedule, and basic training guides. If your district provides something like this, then wonderful. If not, you can take a look at my policies & expectations here. I realize that your classroom does not run the same as mine, so use this as a guideline when making your own handbook. Also, check your state department of education website. Utah has a paraeducator handbook here. I include behavior training at this first staff meeting because I feel like it is essential before walking into a classroom full of students. I hope to prevent bad habits from occurring if I'm clear from the beginning about how to interact with the students and how to manage minor behavior. I also briefly discuss students with Behavior Plans because of the necessity that their plans are followed to a T. Of course, I provide more training on this if the para is working directly with the student. Having a back to school meeting has helped me to not only establish expectations but has starts the year off with open communication and encourages your paras to come to you with issues. I can't tell you how helpful it is to set up a team environment from the beginning! We couldn't do this job without our paras! I'd love to hear your comments! Do you hire your own paras? What do you do to establish expectations and develop positive, working relationships??? Looking for more great tips? Follow me on Pinterest. 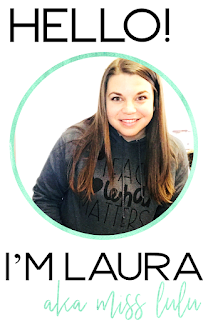 Visit Miss Lulu Special Ed's profile on Pinterest. You're so very welcome! I hope it was helpful. I am a para and I have a wonderful teacher to work with. We have 6 paras in our room, so there is always something going on! This information is great. I have been in situations in the past where I had no clue as to what I was supposed to do. I now work with a teacher who manages her classroom (Paras and students) and there is no bickering among the paras, we all get along, we know what is expected of us and the teacher is available to us to answer questions or help us in any way she can. Ellen, thank you for reading! I agree with you in that it is so much easier when everyone knows what is expected!Thanks for all the great work you do. We couldn't do it without amazing paras! Hello! I know that this is an old post, but I have a question that I was hoping you may have some advice on! I am a first year teacher and will be starting in a classroom where it is likely that the paras will have been there before my arrival and very well may have worked with the students for years - how do I change expectations or put my own expectations in place in this scenario? I am especially concerned because I am young and I worry about leading and supervising people who may well be much older than I. Any advice you might have would be very welcome! I LOVE your blog and am learning a lot by reading through it!! Thanks for sharing your expertise.